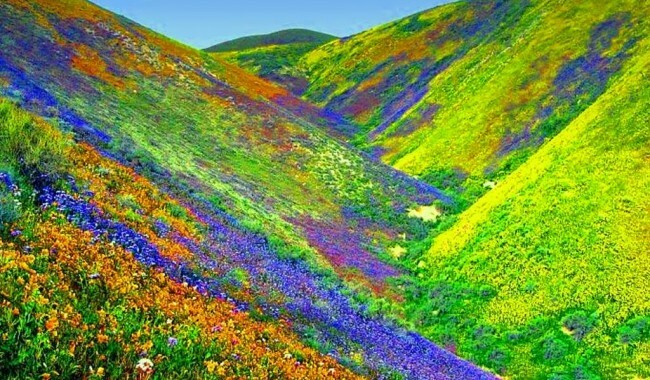 Valley of Flowers also called Bhyundar Valley, Nandan Kanan (Garden of Indra) or Garden of Eden was discovered by a British Mountaineer Frank S. Smythe in 1931 and named it of what it's known today. There are 291 recorded varieties of flowers in this valley. There are white anemones, golden nomacharis (resembling lilies), marigold, delphiniums, violets, eritrichiums, blue corydalis, wild roses, rhododendrons, saxifrage, yellow and red potentilla, geranium, asters and gentians. Grassy meadows run down the cleft of the stream fringed by ice. Overlooking us are the snow clad peaks of Rataban and Nilgiri. Many of the flowers in this valley are of medicinal value which remains in full bloom for 3 months although the composition of flowers keep changing every few days. While walking along the flowers you will come across many butterflies and chances to see great variety or bird and wildlife. The trekkers have been charmed by the beauty of this trail since ages. It starts from Joshimath through the villages of Govindghat and Ghangaria. The valley located at 3350 Meters lies in the transition zone between Himalayas and Zanskar. While the lower areas of the valley is filled with conifers, grassy meadows, moss and shrubs. The upper regions above these grasslands is filled with flowers which bloom in different seasons throughout the year. There is plethora of wild life in this area including black and brown bears, snow leopards, foxes, Musk Deer and Monal Pheasants. One also gets to visit Hemkund Sahib during this trek which is a highly revered Sikh Gurudwara located at an altitude of 4630 meters. There is a well maintained path leading to the Gurudwara which is on the banks of a lake. The Gurudwara is named after this lake (Hem=Ice)+(Kund=Lake). The glacial lake is surrounded by seven mountain cliffs, each adorned by a Nishan Sahib (Religious symbol of Sikhism). The shrine is designed like a star and is said to be the place where Tenth Guru of the Sikhs Guru Gobind Singh meditated. A temple dedicated to Lakshmana, the brother of Lord Rama is also situated in the vicinity of the shrine. For more info about Haridwar, check our Dodital Trek section. Joshimath also known as Jyotirmath lies in chamoli district of Uttarakhanda is a gateway to several Himalayan Expeditions, Trekking Trails and Pilgrim route to Badrinath. It is one of the four cardinal peetha established by Adi Guru Shankaracharya. Joshimath also houses Shankaracharya Math, Narsingh Temple, Bhavishya Kedar, Tapovan (Hot Water Springs) and the longest rope way in Asia to Ski Destination in Auli. It is said that present Kedarnath will disappear and re-appear in Joshimath, hence the name Bhavishya Kedar. The other destinations accessible from Joshimath are Chopta, Rudranath and Kalpeshwar. Around 22 Kilometers drive from Joshimath will take us to Govindghat from where our trail begins. 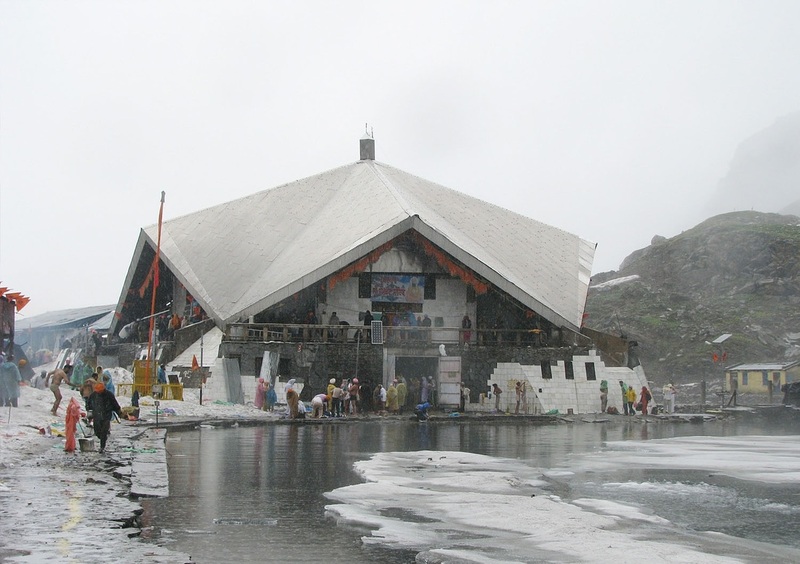 It is also a halt point for pilgrims heading to Badrinath the famous Hindu Shrine. There is a Gurudwara near Alaknanda river and serves as a major landmark. The area has a huge car parking, hotels, guest houses and restaurants. It remains busy from months of May-September. We will walk tracing the path of Lakshman Ganga on a mule track as it climbs past terraced fields and vegetation for a few kilometers till we reach Pulna. The trail from here becomes a little more forested and wild till we reach Bhyundar Village, which is another 7 kilometer distance from Pulna. The trail is comfortable and gradual climb on a moderate altitude. We can halt for some rest here. As we proceed a little further from Bhyundar, our trail will meet a bridge which we will need to cross over the Laxman Ganga River. Ghangari or Govind Dham is 3 kilometer from here although the trail has become a little difficult from the bridge till Ghangaria. We will camp here at the nearby meadows and eat at one of the numerous eateries around here. Today will be easy and most amazing part of our trek. We will leave early after having breaksfast towards the valley of flowers. As we leave alongside the pilgrims headed for Hemkund, we will veer left instead of climbing east to the lake on a well marked trail. The trail goes through coniferous forests on a gentle slope before descending to bridge and a check post where entry fee to the valley of flowers is collected. The trail climbs on a rocky path and we are welcomed with flowers as the forest begins to disappear. The trail will soon level out and will give a sense of walking on a valley floor. 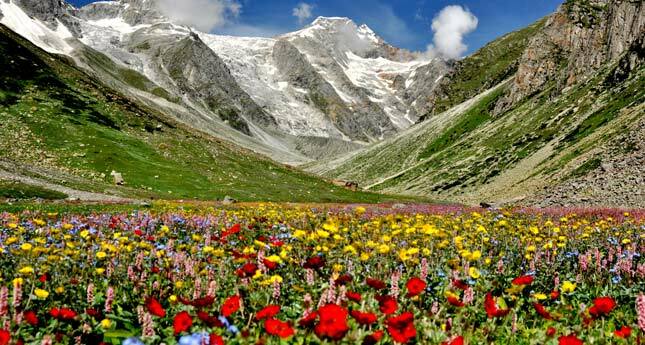 Savour fine views of the valley, click pictures of the flowers and snow bridges as the secluded valley carpeted with hundreds of species of colorful flowers and enclosed by high mountains never fail to impress. In 1982, the Indian Govt. declared this valley as a national park, therefore camping in the valley is henceforth banned. The funny story however is that grazing of animals in this valley was also banned for it's protection but somehow after that the flower population declined and weeds started to flourish. Then it was observed that the cattle doesnt eat the flowers but weeds therefore the step which were taken for protection of flowers were infact endangering them. Now there is a regulated movement of shepherds in the valley and the complete ban has since been lifted. The valley lies in between altitude of 3650 meters and 3950 meters and is enclosed by Nar Parbat (5855 meters), Nilgiri Parbat(6474 meters), Rataban (6166 meters) and Ghori Parbat (6708 meters) We cross a permanent snow bridge before entering the valley and are greeted by silver birch and rhododendron and then a well marked trail leads to a meadow with a profusion of wild flowers. It's best to spend 2-3 days in the valley, however that would mean returning back to Ghangaria every day. We will retrace our steps after spending a few hours here and head back to Ghangaria. As we plan for the trek of Hem Kund Sahib the next day. Today will be a long and tiring day as we begin our 1300 meters ascent to Hemkund Sahib. However the best part is that we will be accompanied by thousands of pilgrims whose faith will give us strength to continue our journey. The lake "lokpal" or "Hemkund" is believed to be the place where Lakshmana brother of Lord Rama and hero of the epic Ramayana meditated. Hindu pilgrims also used to visit this lake during their pilgrimage to Badrinath. In 1930 a Sikh teacher went out to discover the lake which was mentioned in the "Dasam Granth", holy book of the sikhs where Tenth Guru of the Sikhs, Guru Gobind Singh used to meditate in his past life. A remote lake surrounded by seven snow clad mountain peaks. We will continue our journey and cross a bridge above Ghangaria. The trail will become steep here and will cross a series of meadows till we reach the upper reaches of the tree line. The relief is however that after each switchback there is an eatery offering refreshments. The views are breath-taking of the peaks above Bhyundar Valley. After a series of switchback we will come across stone steps which mark the final 300 meter climb of the Hem Kund Lake (4330 meters), however the will prove to be most tiring part of our journey. Visit the lake, splash your skin or take a dip in the icy cold waters of the lake like other pilgrims to wash your sins and make a visit to the nearby Gurudwara. The descent back to Ghangaria should not take more than 2-3 hours, where we can retire in a comfortable and cosy hotel followed by a warm bath and hot and nutritious dinner for a well deserved relaxation. After breakfast we head back to Govindghat where we will reach in a few hours. Our cabs would be waiting to transport you back to Joshimath after lunch.